by itsaboutlincolnHigh Street passes over the original Norman stone bridge, erected about 1160, possibly replacing one made of wood. country. It marks the spot where the Roman Ermine Street crossed the Witham by way of a ford, a bridge was built c 2nd century. 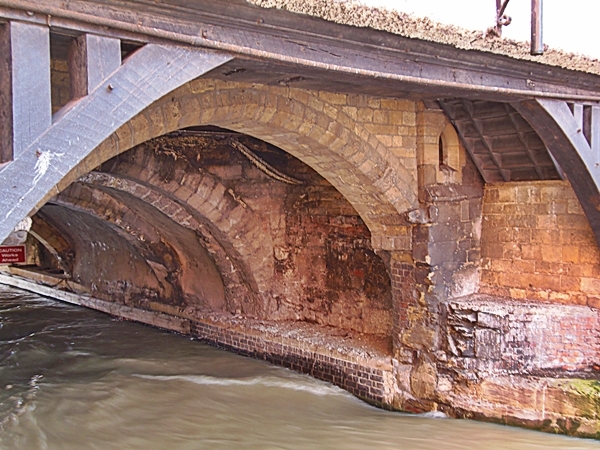 The river was much wider than today and High Bridge was thought to be made of five arches, today only one arch remains. 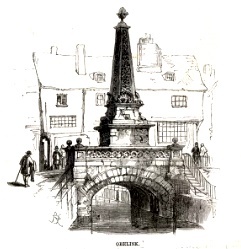 There were many bridges like High Bridge in the middle ages, London Bridge for example, but all the others have long since disappeared, the only other bridges with buildings on in England are Frome Bridge dating from 1667 and Bath’s Pulteney Bridge of 1773. 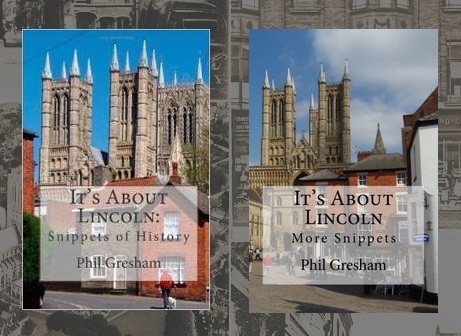 At the Reformation there were as many as 52 religious buildings in Lincoln, one of them was the chapel dedicated St Thomas the Martyr which stood on the eastern side over the vaulted arch of the bridge. The chapel was paid for by Lincoln Corporation c 1200. Following the Reformation the Corporation converted the chapel into a house, it was let as a hall to the Company of Tanners and Butchers, and finally a warehouse until it was demolished in 1763. 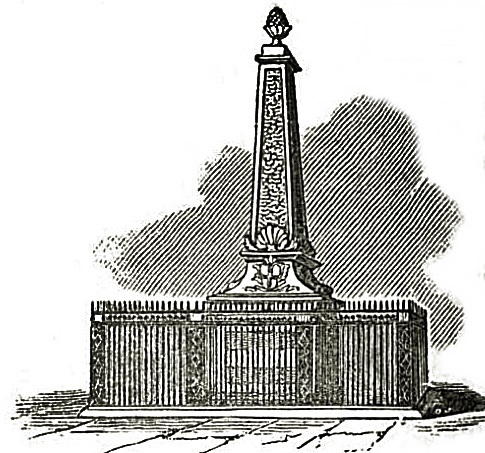 An obelisk was then erected which was also a water conduit which brought water from near Nettleham. The original pipes for this were laid by the brothers of Greyfriars in the early 16th century. 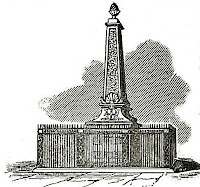 The obelisk was removed in 1939 due to concerns about the strength of the arch supporting it. A reconstruction of the obelisk can be seen at St Marks Shopping Centre. The river route under the bridge was once named "The Murder Hole", bodies could be dropped in the water here without being seen and, with luck, would float downriver to Boston and onto the Wash. The maximum height of 9 feet and width of 22 feet together with an awkward angle under the bridge sets a limit on the size of vessels that can use the Witham from Brayford Pool to Boston, and vice versa. It now has the much happier name "The Glory Hole", this may come from the difficulty of getting large vessels through, there would be some "glory" when a boatman made it through! Until the 1790’s the river was not navigable all year, in summer the bed of the river was often dry; there are tales of horse and coaches driven across the river in summer just west of High Bridge. Joseph Banks (1743-1820), the botanist and naturalist had commissioned the building of the Horncastle Canal, he could see that revenues on his canal would by severely restricted by the problems at High Bridge. The Corporation was reluctant to improve the navigation under the bridge because they earned porterage from the transshipping of cargoes. This reluctance forced Joseph Banks to look at alternative routes. William Jessop (1745-1814), the noted canal builder (locally he built the Grantham and Sleaford canals), was commissioned to investigate a likely route. Jessop put forward a scheme to route barges from the Brayford southwards on the upper Witham to Sincil Drain, in effect by-passing Lincoln. 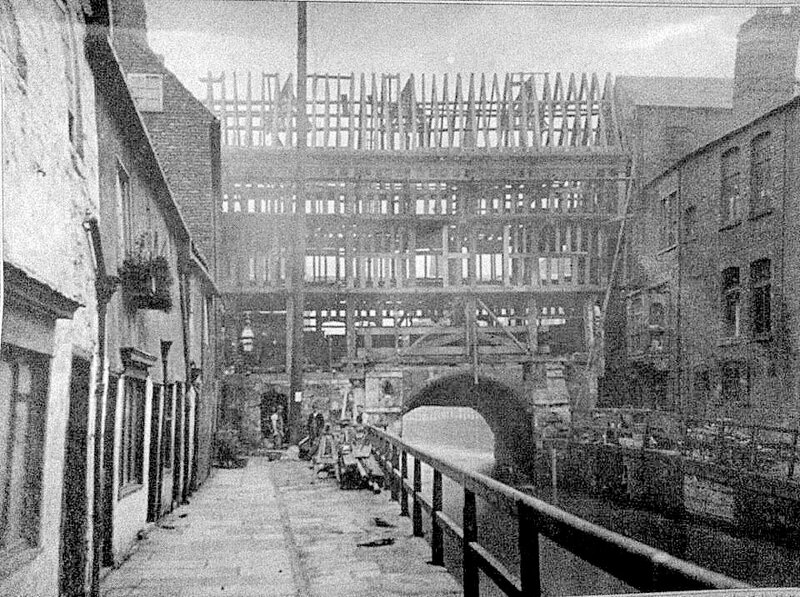 The Corporation realised this would be devastating for the economy of the city and, in 1795, the bed of the river beneath High Bridge was lowered at the expense of the proprietors of the Horncastle Canal. To celebrate the event boards were laid on the dry river bed and a dance took place under the bridge. 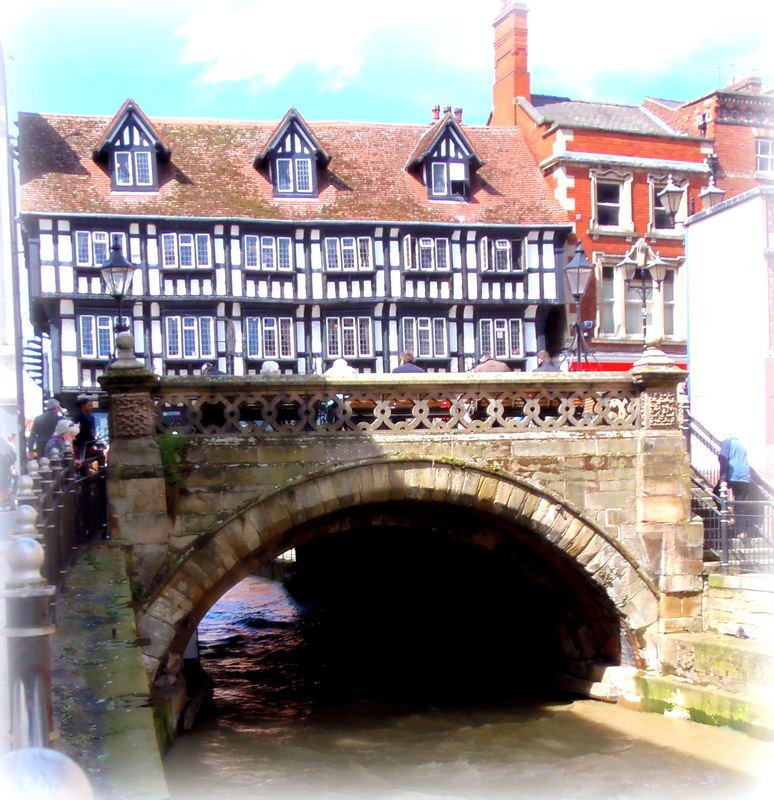 The buildings on High Bridge were renovated and put back to their original half-timbered design in 1902/3 under the direction of architect William Watkins. Jettied forward of the first-floor are carvings of King Edward VII and Queen Alexandra. The High Bridge remains an architectural gem opposite some of the ugliest buildings of the 1960s and 70s. Stokes coffee shop is an excellent place to enjoy a coffee. R W Stokes Co. has ground and blended coffee here for over 100 years. Either side of the shops on High Bridge there are steep narrow steps leading towards Lincoln’s Brayford, where barges and ships loaded and unloaded their cargoes. From the footpaths on the west side you can get an excellent view of the rear of the shops.